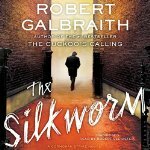 The thing about The Silkworm is that, at it’s core, it’s a “who-done-it” in the good old -fashioned tradition with a murder, several suspects and their various motives, and a smart, interesting, rather unique detective duo. The story is good and the main characters are delightful, but that hardly describes the high level of this rather literary detective novel. There’s a certain literary aspect which just tickles, especially considering it’s from J.K. Rowling. Also impressive is that the characters are all individual and unique – the lead detective, Cormoran Strike, is a disabled Afghanistan vet (UK), who has gone into the detective biz. He has an on-again off-again relationship with the upper class Charlotte – a total basket-case. Strike’s side-kick, Robin Eliacott, wants to be a detective and was hired with the understanding that Strike would train her. She has a fiancé who is not sold on her choice of jobs. The relationship between Strike and Robin is not romantic but it’s quite friendly and quite respectful. These two are fully developed but the other characters are more like “types,” but because there are quite a number of them, it works well. Each chapter opens with epigraph, a quote taken from some 18th century play by various authors and these are totally appropriate to the content of the chapter – I’m impressed. The setting is the publishing industry of London – what could be more literary? And there are little passages which reveal the ideas which float around that element even today – a fair satire of them, actually. – lol Finally, literary allusions and opinions abound throughout the novel as the characters discuss each other and the book at the center. One day in London a rather shabby woman named Leonora Quine comes to Strike’s office with a request that he find her husband, Owen Quine, a middle-aged writer of trashy novels, who has been missing now for some time. His most recent manuscript has been rejected by the agent as being libelous. Then he disappeared. Strike takes the case but shortly afterwards Quine’s body is found. He has been murdered in a really gruesome way – actually, it turns out, in a way very similar to the murder in his libelous book. So who did it? Why? And how much information does that gross-out libelous book actually hold? Many twists and turns, a couple of close calls and a very satisfying ending – my kind of book. I liked The Cuckoo’s Calling well enough, but I wasn’t going to read any more of Rowling’s mystery novels – until I read your enthusiastic review. Damn, now I’ll have to give The Silkworm a try. I don’t like mysteries – I never care who did it. But I like interesting characters and fascinating backgrounds.